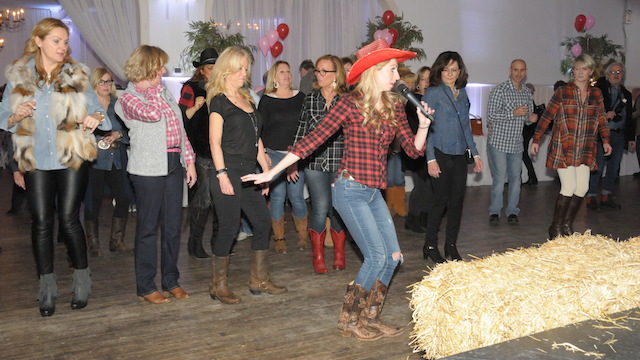 It's time to break out your cowboy boots and hat because you're in for a rip roaring good time when The Ellen Hermanson Foundation holds its Denim and Diamonds fundraiser at 230 Elm in Southampton on Saturday, March 18th. The evening will honor Stacy Quarty, President of Lucia's Angels and Vice President of the Coalition of Women's Cancers. 230 Elm owner Tim Burke will host the festive affair, with Lisa and Jim Brady as honorary chairpersons. "The Ellen Hermanson Foundation is excited to once again be presenting Denim and Diamonds," shared Julie Ratner, Event Chair and Ellen Hermanson Foundation Founder. "Denim and Diamonds is going to be a great party, and we hope that many people will join us to support the important work of the Foundation, which keeps all of its funds within the South Fork community." Help the Foundation "give breast cancer the boot" from 6:30 to 10 p.m. as you enjoy bites from local restaurants - including 230 Elm, Blue Duck Bakery, Buckley's, DeJesus Deli & Taqueria, Erica's Rugelach & Baking, Co., The Golden Pear Café, Julie Bakes, Little Red, Peconic Gold Oysters Inc., Red Bar, Robbins Wolfe Eventuers, Smokin' Wolf, Stuart's Seafood Market, The Seafood Shop, and Union Cantina, music from a DJ, loads of dancing - don't be surprised when a few country favorites come on - silent and live auctions, and much more. The event's highly anticipated live auction items include two tickets to Bravo's Watch What Happens Live with Andy Cohen; a five day safari for two at the Ezulwini Game Reserve in Kruger National Park, South Africa; two tickets to Billy Joel's June 6 concert at Madison Square Garden; four tickets to the Hampton Classic Horse Show and two Tickets to Grand Prix Sunday; and a catered lunch for four by Robbins Wolfe Eventeurs. Proceeds from Denim and Diamonds will support the Ellen Hermanson Breast Centers and Ellen's Well. Individual tickets are $125, benefactor tickets are $250, and junior tickets (29-years-old and under) are $75. The Ellen Hermanson Breast Center, a designated Breast Imaging Center of Excellence by the American College of Radiology (ACR), offers a wide range of essential breast health services, including education, early detection screenings and breast cancer treatment and support. Ellen's Well, an initiative established by The Ellen Hermanson Foundation that is administered by the Southampton Hospital Foundation, offers psychosocial support to East End breast cancer survivors and their families, as well as programs that include Neighbors Helping Neighbors, transportation and, Pink Bags. 230 Elm is located at 230 Elm Street in Southampton. For more information, visit www.ellensrun.org.